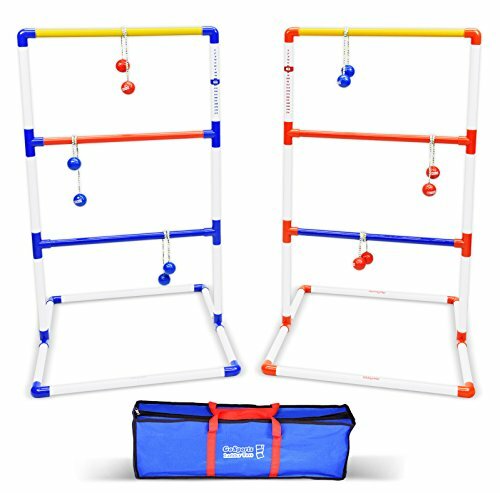 Whether you are upgrading an old ladder toss set or finally joining the fun, the GoSports Ladder Toss game is the perfect choice. We built this set using premium materials so it will last for years, and we also simplified the assembly so you can be setup and playing within minutes. While some of the cheaper games out there use ultra thin, low quality PVC (less than 1mm thickness), we used robust 2.5mm PVC that can handle even the hardest tosses. There is nothing worse than having a game constantly interrupted by the PVC joints falling apart, so we didn’t skimp like the others. Our Bolas (projectiles you throw at the targets) are made from real golf balls connected by high density woven nylon, which provide the best feel and their thick rope prevents tangles. Everything can be conveniently stowed in the included zip-up carrying case for maximum portability (upgraded to durable polyester since Jan 2013). Our goal is to provide you with the best possible game so you can get out there and have the most possible fun with friends and family. If you are looking for a more economical Ladder Toss set, please checkout our GoSports Standard Ladder Toss Set. #1 SELLING LADDER TOSS ON AMAZON - Top Quality, Price & Customer Service for Family Fun!